Thread: Do you know this pattern? I made this quilt for my husband a couple of years ago, and he loves it. I get compliments on it all of the time and now I'd like to make another one in a different color. I have torn my quilt room apart and can't find the pattern. It's one very simple block that uses up a lot of scraps and fat quarters. I think I might have gotten it from a quilting magazine. Does anybody recognize it? THANKS! I don't know that pattern, but it's very nice! I hope someone finds it for you and share with the rest of us. 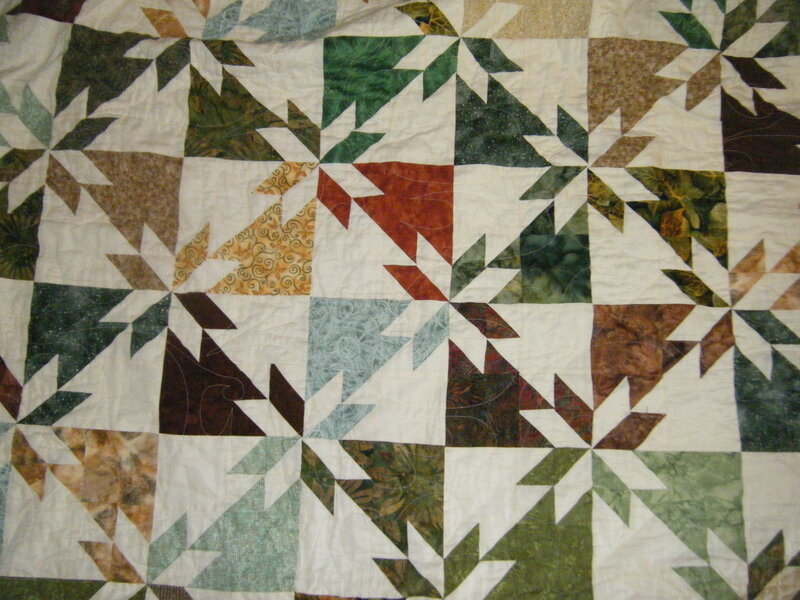 Hunter's Star, a beautiful pattern, and your quilt is lovely too. I'm always amazed at the knowledge on this board. I just love it. You are all awsome! I've searched for months looking for this pattern. It IS Hunter's Star. THANK YOU! You are the proud maker of a beautiful Hunters Star. I am making one as we speak. it is so easy to make. I do use a lot of starch to keep the bias in line! EDIT: You can probably find a free pattern on line if you do a search. here is one! Last edited by ube quilting; 05-26-2012 at 01:11 PM. Beautiful quilt. It's one that's on my bucket list. It is a beautiful Hunter's Star! If you do make another one, please post it, too, OK? Is it really easy to make? I've always wanted to make one but thought it looked kinda futzy to do. Hmmmm... something else to add to my to-do list? its a hunter star and its very nice!!!! I checked out the links and patterns everyone suggested and found that there are two versions. One is made using trapizods (and they sell a special ruler for this pattern). The quilt I orginally made (and posted above) was made with half square triangles, not the trapizods and I tracked that pattern down to Fons & Porter. It was in an old magazine, but they still sell the pattern online. The half square triangle pattern was super easy because you can use the thangles type paper. I'm already in my quilting room sorting through my fat quarters! Can't wait to start sewing. by now you know it is the hunter's star...yours is adorable! Here is a tutorial using only half square triangles and squares. That's one beautiful Hunter's Star! Can't wait to see the new one! It is a Hunters Star. I did one a couple of years ago , was easy for me. I used a light Batik and a dark Batik. Turned out really nice but if/when I do another one I will add at least one border. I didn't put one on the light and dark but wished I had. Oh well, live and learn. The pattern is called Hunter's Star. You have made a nice job of it. Looks like a hunter star - beautiful. Before everyone goes out to buy "special" rulers, you only need a standard ruler and a cutting mat with a 45 degree angle marker to cut the piecies. Most of us have this stuff already. I dunno, but I've seen it before, it sure is pretty! Thanks Ube Quilting for reminding me of Roolen's tutorial. I want to try this one day. Need to make a folder on this computer called bucket list. So many ideas and so little time. Great quilt! Thanks for sharing. Glad someone could tell you what pattern it was. I'm going to mark the pattern and maybe try it later.